With the warmer weather coming we need to have a great drink recipe on hand that uses all the flavors of the season! Sit back, relax and enjoy this Berrylicious Sweet Tea. *Affiliate links are included in this post. Please read my Discloser Policy. I received Stash Tea complimentary but all opinions stated in this post are my own. 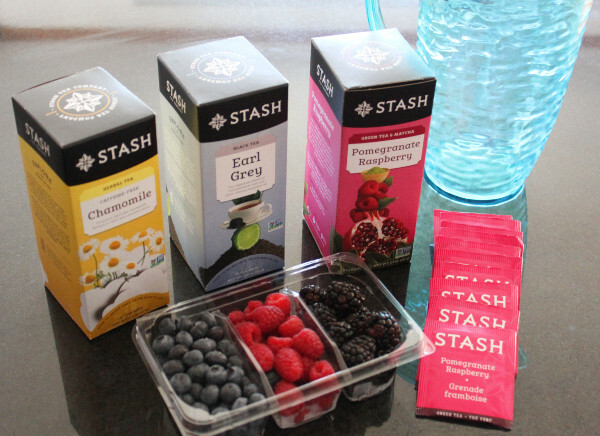 For more information visit the Stash Tea website and visit their about page. Brewing up a big batch of this sweet tea is the perfect way to enjoy the warmer weather when entertaining friends and family. Set up the snacks, grab some glasses and ice and you are set for a relaxing afternoon. Stash Tea is offering Bottom Left of the Mitten readers a discount on online orders. and use the Promo Code: BOTTOMLEFTOFTHEMITTEN-SC. Start by gathering up the ingredients for this sweet tea. 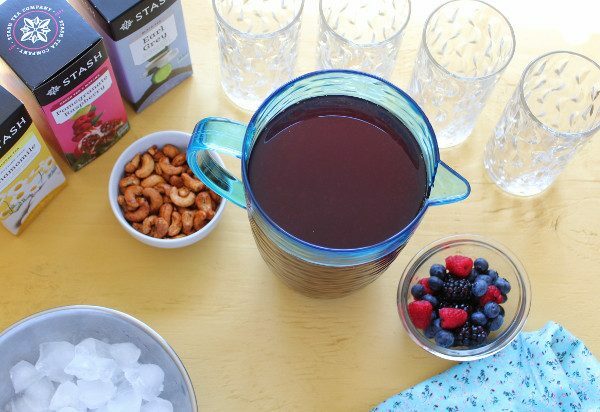 You will need a large pitcher, 10 Stash Tea Pomegranate Raspberry bags, berry trio (blueberries, raspberries and blackberries), and 10 cups of water. In a large stockpot bring 10 cups of water and the 10 tea bags to a boil for 14 minutes. Be sure to clip the paper ends off so that the tea bags can be completely submerged in the water while boiling. Next, smash all the berries together, this will release their flavor better. Take the pot off the heat and remove the tea bags. Add the smashed berries to the pot along with the honey. Let the tea cool completely. Pour the liquid through a strainer into a clean pitcher. 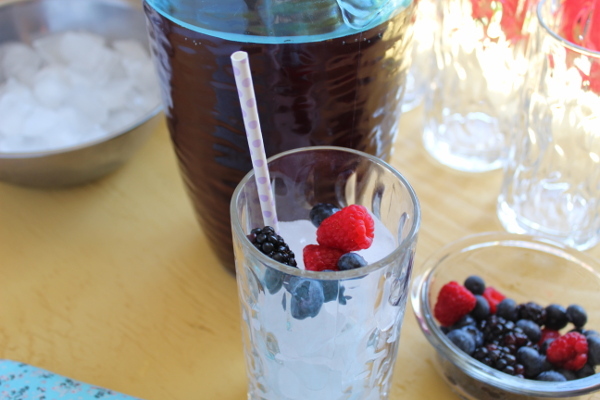 Serve tea over a glass of ice and more berries. 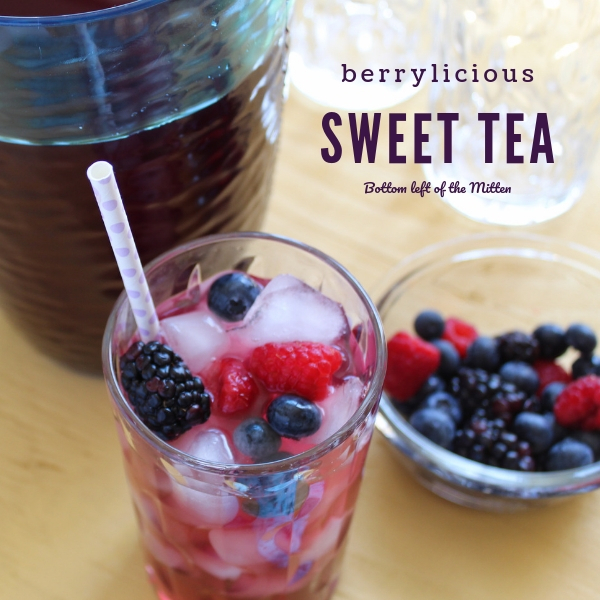 Brew up something special with this Berrylicious Sweet Tea! 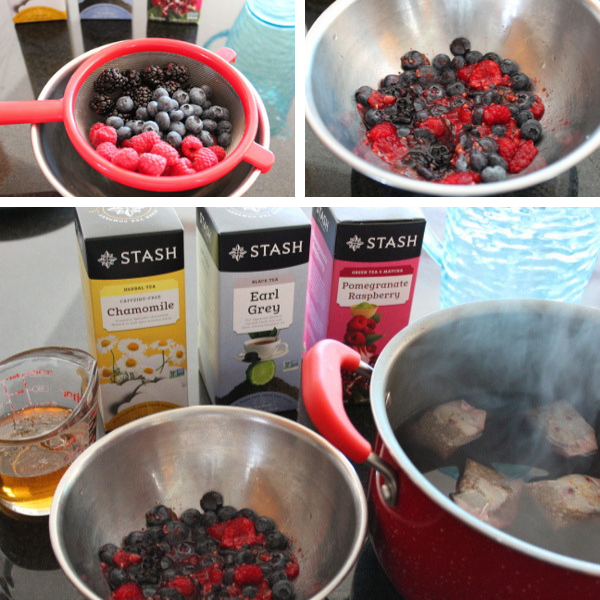 Flavored tea mixes with berries and sweet honey. Pour over ice for a delightfully sweet treat. Smash all the berries together, this will release their flavor better.